It really is quite “smashing” being a parent – well, most of the time. What’s funny is how, for months, you think breastfeeding is one of the toughest, most time consuming jobs in the world, UNTIL you suddenly have to add one, two and eventually three “solid food” meals a day on top of it. As previously mentioned, my capabilities of mushing, smushing and sliming are still D- at best. 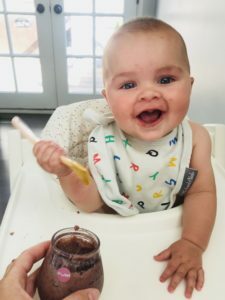 I think I might be better at it if more food was the consistency of a ripe banana or my baby didn’t enjoy screaming at an absurdly high octave three feet away from me in her saucer on the floor. 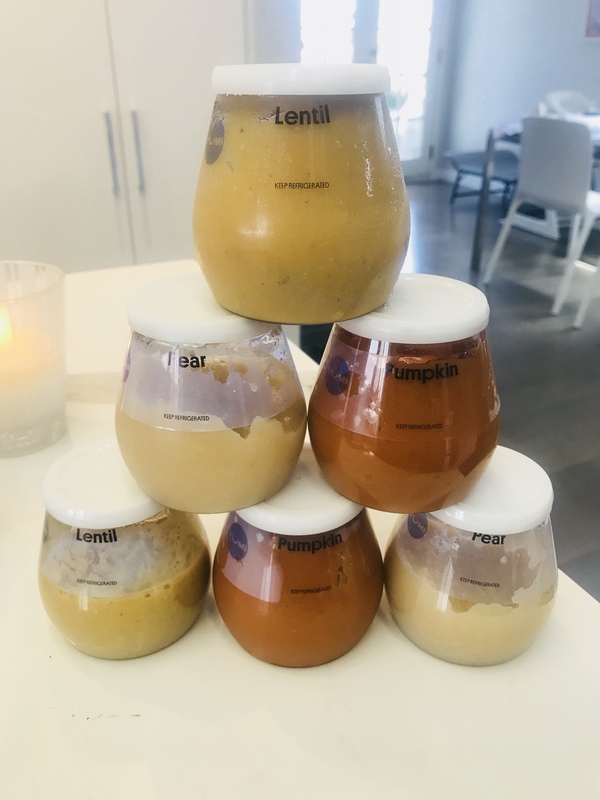 Needless to say, when organic super-food and L.A.-based delivery group “Yumi” came to our mommy & me class last month, I instantly thought it was fate handing me my Christmas presents six months early. Also, if you know me, I’m semi-obsessed with all things “subscription”. We quickly learned that Yumi was started by a mama who put a team of chefs and nutritionists together who know way more than I do about what babies really NEED in their day to day diets. From 4-6 months they keep it lower key with single-ingredient mixes such as white bean, apple, carrots and broccoli. At seven months, baby can then graduate to the big-league blends. These blends are fresh, there’s no sugar added AND they’ve thought up the most over-the-top creative ingredients to mash together. Try blueberries, coconut milk, quinoa, chia seeds, banana, dates, wheat germ oil and Japanese sweet potato … just to name one (the “Blue Yamma”) OR sweet potato, red bell pepper, apple, chard and quinoa in their “Bell Pepper Soup”. Yes, Yumi is pretty fancy, and yes you’ll likely become quickly jealous while munching on your lactation bar next to your baby’s Michelin-style jar of puree, but also, if you’re anything like me, you’ll either steal a bite (or half) of it, or will just be excited at the phenomenal photo opportunities that they present. With 60 unique blends I can’t foresee baby or me getting bored of this any time soon. The one thing I WILL say though is that in the beginning you likely wont get through the minimum order of five (4.5 oz.) blends per week BUT you CAN stretch one jar out to two or three feedings and/or freeze what baby doesn’t eat. You can ALSO skip as many weeks as it takes to catch up OR can cancel at any time. It starts at $35/week, which I know might be pricy, but I say give it a try it for free (we did!) through promo code “iciwid35” and then see where the baby blend breeze takes you from there. At the very least you can give your hand a, much needed, moment of rest from the constant mashing, caning and cleaning.